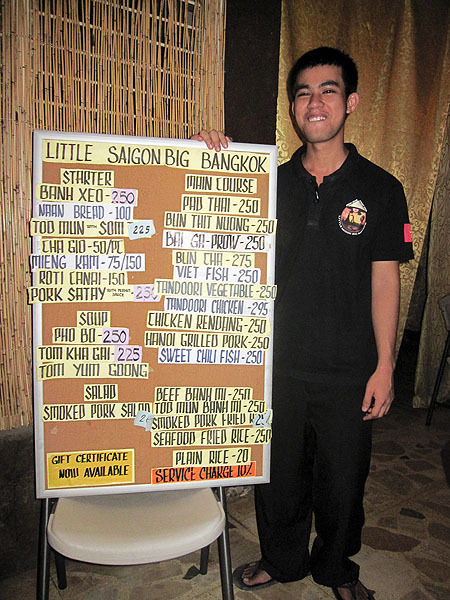 Little Saigon Big Bangkok has been showered with praises by blogs and mouths. It is time (after putting it off for so many months) a bunch of us (taking someone's advice to best go there in a group) see and taste what the furor is all about. 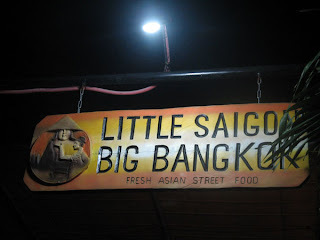 Little Saigon Big Bangkok Fresh Asian Street Food. Fresh Asian street food. 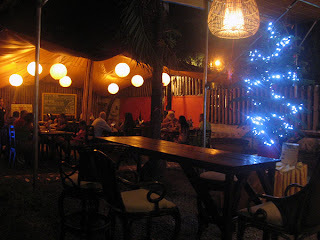 It is street food eaten not on the street (the closest to it being on the street is their al fresco area with the dust and exhaust filtered by a bamboo fence) and paid for in a not so street price (up to five times the street price). But we are nowhere near the streets of Saigon and Bangkok and there's nothing else to do but direct our attention to the staff and his big menu board while trying to avert our eyes from the prices, at the same time throwing questions his way (good for how many persons? spicy? what kind of fish? what's your bestseller?) and mentally trying to count the money we have in our pocket. The answers to the first two questions above I remember. Their portions, according to the guy giving us a crash course on their food, are good for two to three persons, except for the bun cha (good for one to two only). 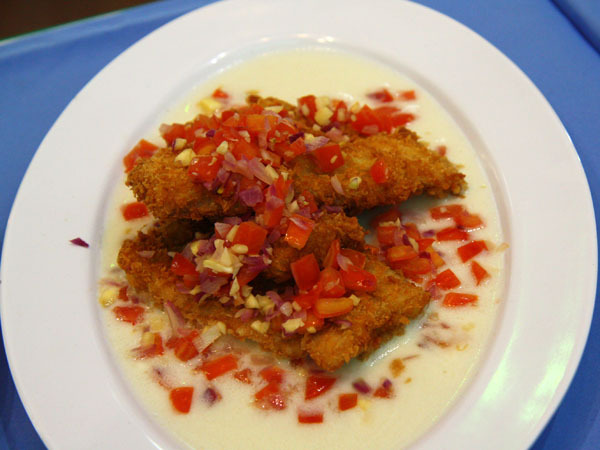 The dishes are spicy except for the chicken rendang, but there are dishes that can be served mild or have the chilies on the side. The good news: Everything was delicious. Pad thai was almost almost like the real thing. 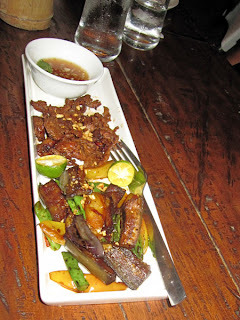 The veggies on the Hanoi grilled pork were tasty and cooked just right. The pork was tender. 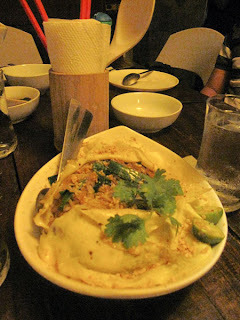 And the chicken rendang (yes, I remember now, it's one of their bestsellers) absolutely beat all the other dishes we had that night. 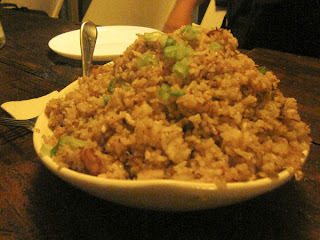 The tom yum goong and seafood fried rice looked like it could feed up to five persons with regular appetites. The bad news: Yes, we found everything delicious, but for familiar dishes, we cannot help but compare. 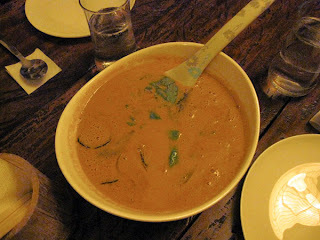 The tom yum goong was okay, though I've had better. 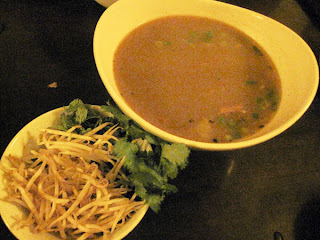 The pho bo was quite different from what I have tried in Vietnam. 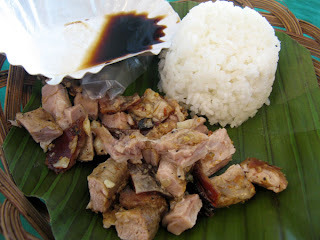 This one tasted pochero-ish to me. It lacked all the zing from the herbs and spices. 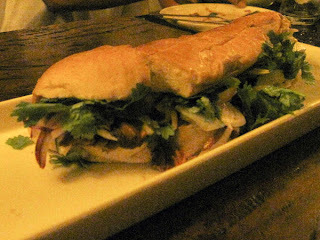 Their banh mi was very different from the ones peddled on the streets of Vietnam (I think it's missing the Vietnamese ham and the germy hands that made them, the latter is, of course, good news). Its taste reminded me of a steak sandwich. 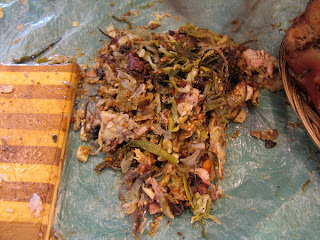 There was more vegetables than pork in their Hanoi grilled pork. The herbal iced tea? Watery lemongrass. The lemongrass tea from Shanti Shala Yoga has more of a kick to it. 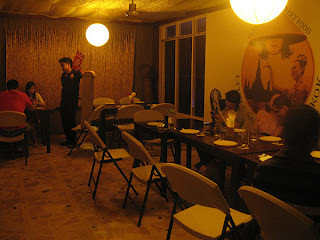 Conclusion: I call this place, Little Serving Big Budget --- for its price, I would expect more on the plate! But maybe it's just my cheapo self talking. If you are budget conscious, do not order without asking for the price. 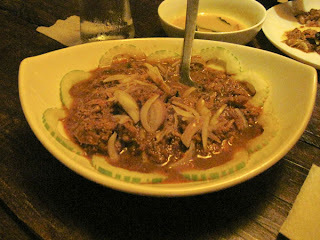 (The price of the drink gave us a surprise, it was Php 200 for a pitcher.) Do not take my comments to heart. Leave your expectations behind, bring a stuffed wallet and an empty stomach, and enjoy the food. 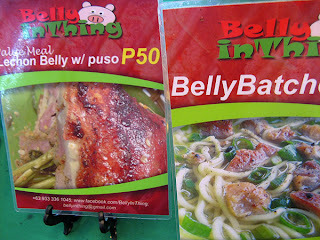 Each of the dishes we ordered costs Php 250. The pitcher of herbal iced tea costs Php 200. 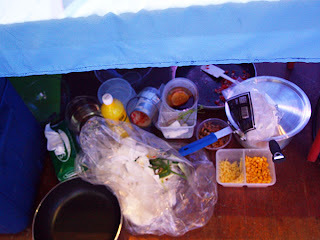 10 dishes, 2 pitchers of iced tea, 7 cups of plain rice (Php 20 per) to feed 11 persons. Total bill? (Drum roll please.) 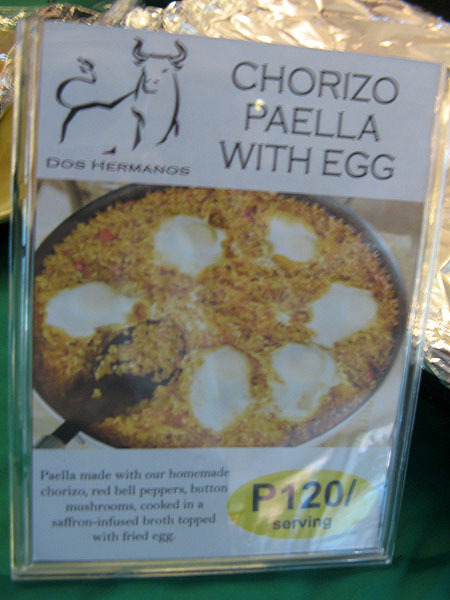 Php 3,344 (including 10% service charge.) 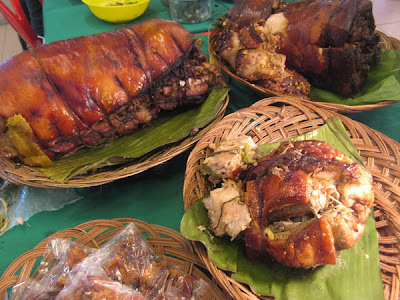 That's Php 304 per person. Ouch. 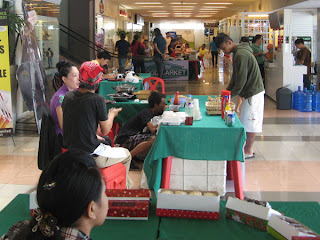 Banilad Town Center (BTC) plays host to Cebu Food Market [0933 467 5890] every Saturday from 10AM to 9PM. 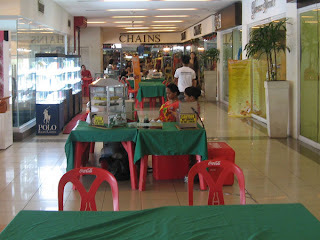 Various vendors ply their ware at the ground floor of BTC, and there's something new to discover each week. At the time of my visit, the market offered lechon belly, rice meals, siomai (dumplings), brownies, potato nuggets, paella, empanada, and veggie burgers. 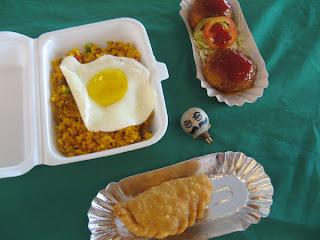 From left to right: Chorizo paella with egg, chorizo empanada, potato nuggets, and spicy lechon belly with rice. 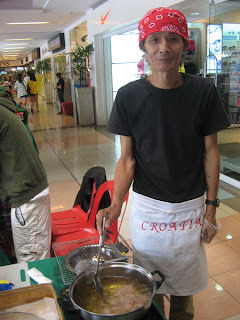 This Japanese guy, Toni, has a little stove and a pot of oil ready for deep frying nuggets and lumpia. The food on his table don't look too interesting. That's what I thought. But don't judge the food by its presentation. 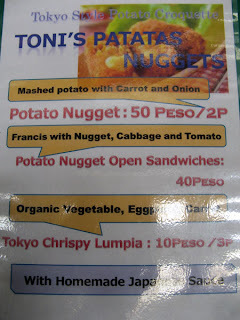 I was delighted to find the nuggets to be mashed potatoes. It went well with their homemade sauce but would have been better with the Japanese mayonnaise (they ran out of mayo at that time). 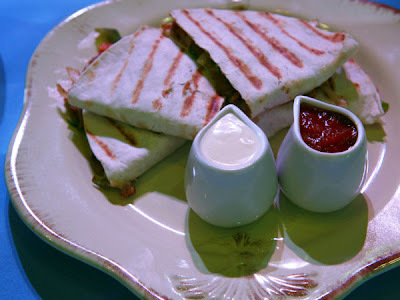 I was also able to try their potato nugget sandwich on another day, and who would have thought that potatoes as palaman (sandwich filling) would be lip-smacking? 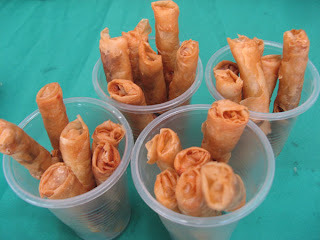 Couldn't say much for the lumpia though since I didn't try it. 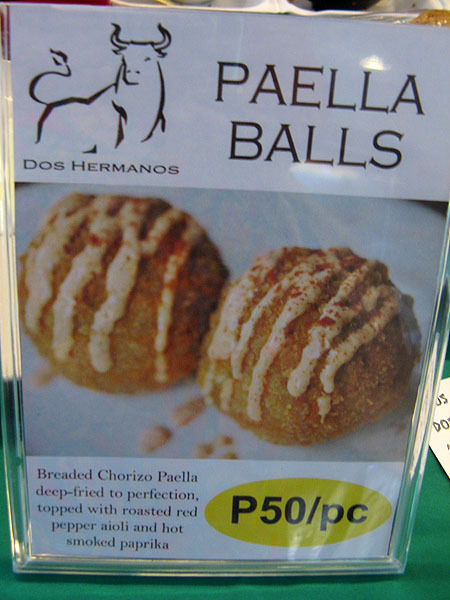 In another corner, a Spanish-looking guy, helped by two ladies, sells chorizo paella, chorizo empanada, and paella balls. 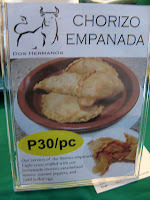 No for sale sign for Spanish chorizo but they do sell such, priced per kilo. I found the portion size for the chorizo paella too small for its price (Php 120). As for its taste, I was a bit disappointed, but blame it on my expectations. 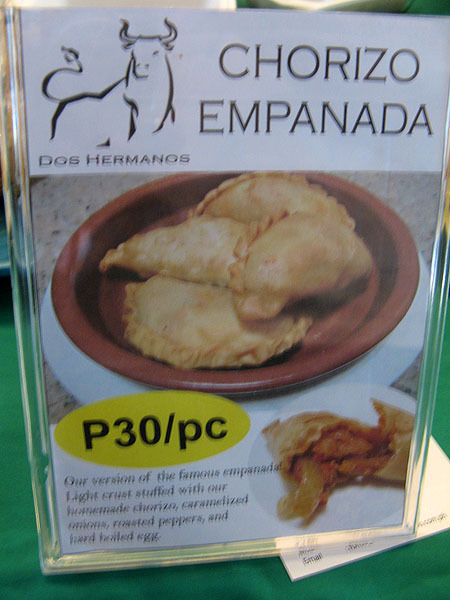 The chorizo empanada was forgettable (I already forgot how it tasted). 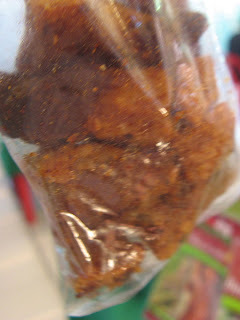 I took home half a kilo of Spanish chorizo and my mother loves it (and to think she doesn't like anything spicy). We had it for breakfast every day until our supply ran out. 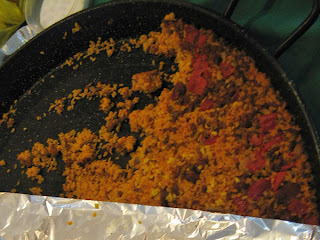 You can also ask for the tasty belly stuffing. They give some for free. I do not know why it took me so long to open the pages of this book by Khaled Hosseini when it has been sitting in my shelf for years. I'm glad I finally did. Of all the books I have read this year - I'm on a mission to read 52 books a year or one book a week - it's one of the few books that I had a hard time putting down. An indication, to me, that what I have in my hands is a really good one. Friends: Amir, the son of a wealthy man, and Hassan, the son of the wealthy man's servant. Unlikely but friends. The annual kite tournament forever etched in their memory. The rest is up to you to find out. I am quite positive you know that this has been made into a movie five years ago. If you've seen and loved the movie, do give the book a go (even if you already know how the story goes). 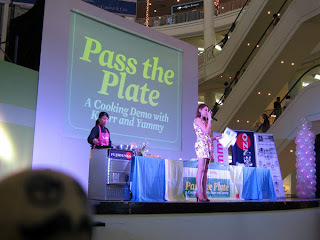 Pass the Plate... to Me! What becomes when a 21st century food magazine teams up with a product from the 19th century? 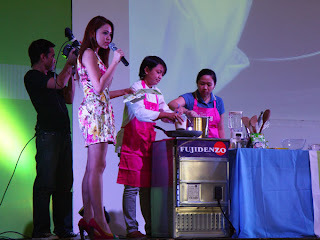 I had a once in a blue moon opportunity to be invited to this cooking demo last November 24. 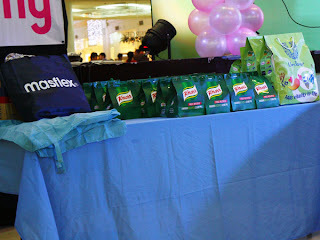 It was held at the Activity Center of Ayala Center Cebu and was organized by Yummy Magazine. Haven't heard of Yummy Magazine? 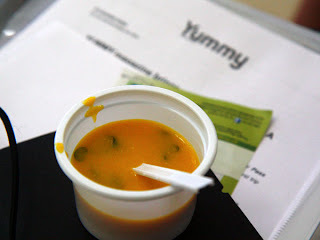 Yummy is a modern food magazine for anyone who loves to cook and eat. 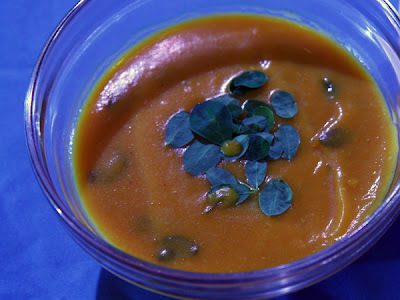 It features easy cooking guides for everyone. 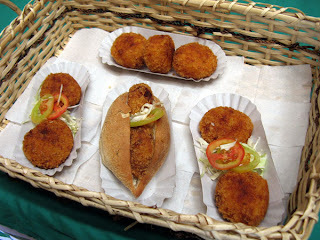 Also, they have a nice online presence - do check out their website (or not - coz it will just make you hungry. 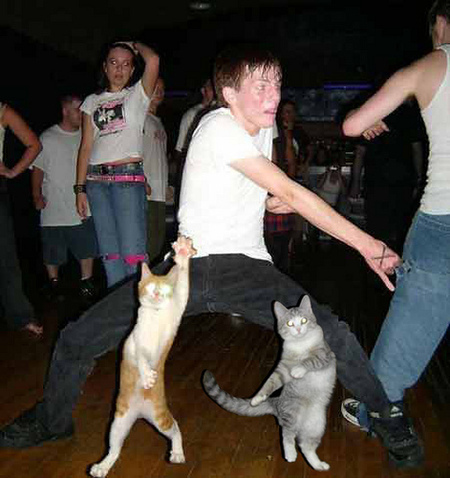 Hehe). 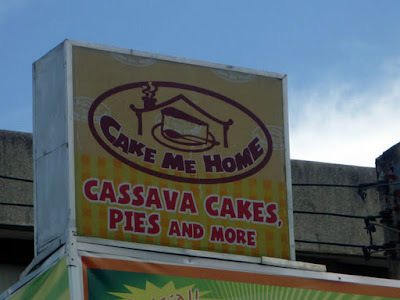 If you want food related things and more, visit their website, like their facebook page, follow them on twitter, or pick up the latest Yummy magazine. It was my first time to watch this kind of event live, and I was expecting to see a potbellied mustachioed guy with a French accent declaring "Délicieux" every time he tasted his dish. 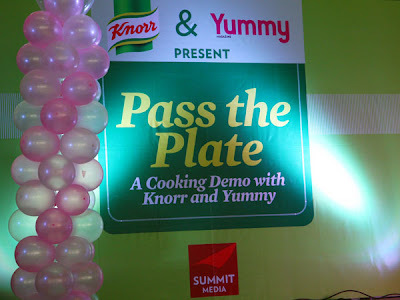 Instead, they featured two stunning chefs - Knorr's resident chef Chef Dianne dela Cruz and Yummy's contributing chef Chef Katherine Jao. Take out the cookware and the aprons, and one couldn't really tell if it's a cooking demo or more like a women's talk show event. 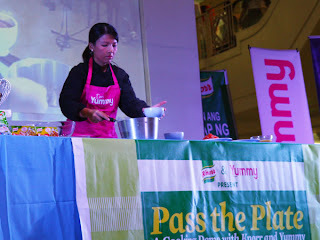 Left: Chef Dianne dela Cruz preparing the Moringga-Squash Cream Soup. 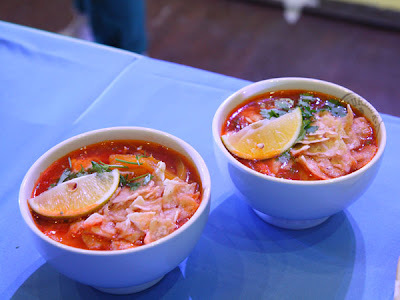 Right: Chef Katherine Jao adding ingredients to her Mexican Tortilla Soup. 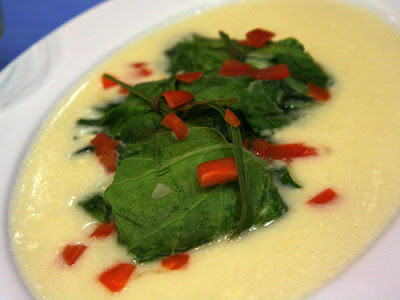 For the demo, Chef Dianne cooked Cream Dory Fillets with Sofrito (sofrito, commonly known here as ginisa), Binalot na Tilapia sa Pechay (Sinanglay, a Bicolano dish), and Moringga-Squash Cream Soup. 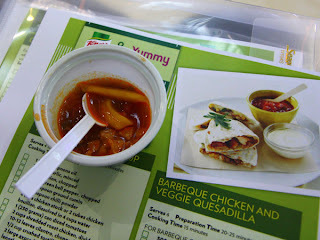 While Chef Katherine brought in a Mexican flavor with her Mexican Tortilla Soup and Barbecue Chicken and Veggie Quesadilla. 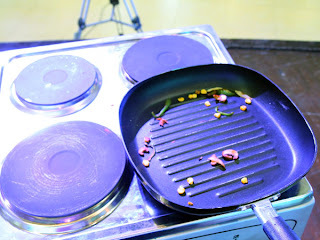 After every food demo (every time a meal has finished cooking), I could hear myself saying "Please, please. 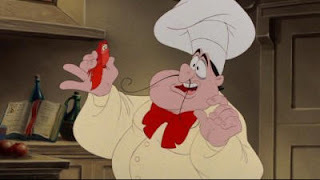 Pass that plate...to me...to meeeeee!" Indeed they passed samples. 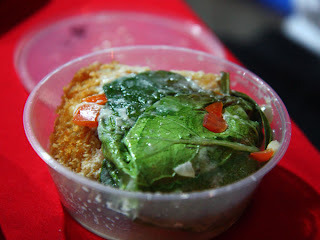 Albeit small, the flavors were undoubtedly - for lack of a better word - flavorful. Like flavors hyperactively dancing crazy to Dubstep, except that they're party-rockin' in my mouth. 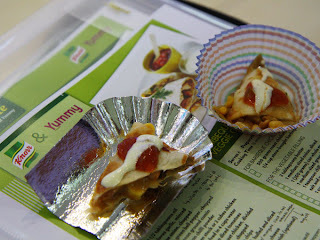 Really tasty and can be prepared in just 30 minutes. The flavors were fighting. Cilantro ownage. 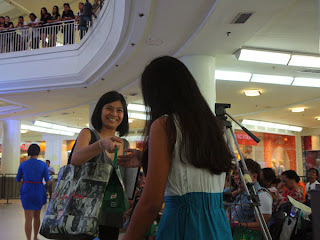 Giveaways... for participants who answered the questions correctly. 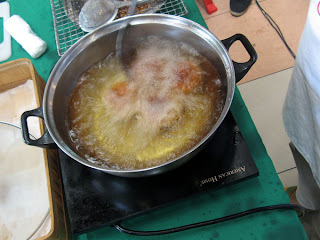 The lemon grass serves as tie and flavor. But what I really planned was to look for a container and take home this orphaned good looking dishes (with permission of course!). 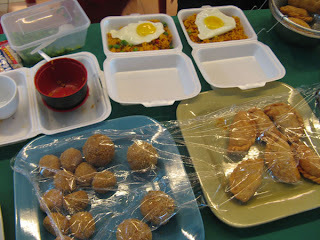 Journey to the Center of the Table: The Search for the Take-home Container. 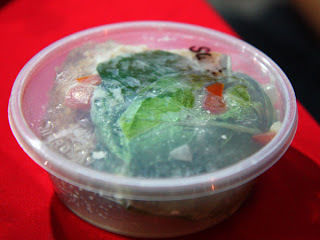 Good thing Chef Katherine was kind enough to give me a small round plastic container which was used for the sugar. With quickness I replaced the contents with two slices of Cream Dory Fillets and two of the Binalot na Tilapia. For me and my date. What to eat for dinner? Solved!